An HFMA member for more than 40 years, John Dalton presided over the Chapter's 13th Annual Institute in 1989. 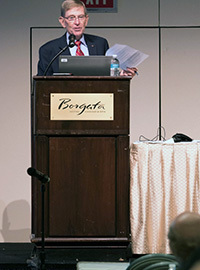 He served on HFMA's National Board of Directors from 1994-96 and, in 2001, was the 43rd recipient of the Frederick C. Morgan Lifetime Achievement Award. John is the only New Jersey Chapter leader to receive that annual award. He retired as Senior Advisor to Besler Consulting in 2010, but continues to be active in healthcare. A former Board Chair at Children's Specialized Hospital, he was named an Honorary Trustee in 2006 and serves on the Audit and Compliance Committee. John's been a Board member at St. Joseph's Healthcare System since 2003, and currently chairs the Strategic Planning Committee. We're delighted to welcome John back as Master of Ceremonies for the 41st Annual Institute.